February 8, 2016 - This visit with Bruno took an unexpected turn, and this experience shed even more light into the unpredictable life that Jacel and Bruno lead. I know that there are hundreds, if not thousands of other families that can relate to their story. The numbers are baffling and the stories are heartbreaking; there are so many suffering day in and day out from debilitating illnesses. In the past week alone I personally know of three children that have ended up in ICU. These families live in fear not knowing what each day will be like for their child. I met Jacel over at B & V Thera-Pro Associates, in Miami, FL., where Bruno receives therapy. This is his home away from home you could say. He has three different types of therapies, each for one hour, three times a week. It's wonderful to see this smile on his face. Remember, this is a little guy who is four years old and can not speak. Every tiny task he manages is seen as overwhelming success. He is pictured here in his new chair/stand that he has recently received, it enables him to be in a standing position without assistance. When Bruno was finished with therapy, Jacel took him to get his hair trimmed. Bruno left with a nice little fade on his head. We decided next time he should have a couple thin lines shaved on the side. He would look really cute with that. I had a little scary moment after we went to grab something to eat. Jacel needed to run into a store, and I waited in the car with Bruno. I was sitting talking to him and shooting pictures with my phone, when all of a sudden he started seizing. I can say that an overwhelming rush of panic went through my body. While I have seen him seize many times, I have never been alone with him when it has happened. I wasn't sure what to do. And, being unsure of how long Jacel might be, and not knowing how long the seizure would last, the moment was nerve racking. "What do I do? " I was envisioning myself picking him up and running to find her, but I wasn't sure exactly where she was. Just as I was about to get out of the car, I saw Jacel coming around the back of the car, and I thought, "Thank God! February 9, 2016 - On this day, we met with Dr. Ian Miller at Miami Children's Hospital. He is Bruno's neurologist. This was to be just a routine visit for Bruno. Dr. Miller was just following up with Jacel on how Bruno was doing. Bruno has been fortunate to have been selected for a CBD trial being conducted at the hospital. I can only imagine how many other parents would wish to have their child be included in such a fantastic study such as this. Jacel says, "He was on the blind study the first four months, some days were stable, and some days were hard. It was hard to tell." Meaning that she is not sure if he was receiving a placebo at the time, or if it was the actual CBD. After the first four months of unknowing, he then began truly receiving CBD in September of 2015. Note: When I first met Bruno in August of 2014, he was having over 300 seizures a day. Then he went to Colorado and California by November of 2014 and started on Jayden's Juice, Charlotte's Web, and other cannabis oil such as THC oil, to help hen big seizures were present. Bruno then had a sudden decrease in seizures, he was down to 50 a day. "During our use with cannabis we prevented the use of rescue drugs, as cannabis replaced them with little side effects compared to the rescue drugs used, such as Diazepam and Klonopin. Imagine if he was on CBD and THC combined legally here in the state of Florida where he would receive the correct dosage of THC oil that he needs instead of harmful pharmaceutical recue drugs to treat his major seizures!" In March of 2015, Bruno stopped cannabis all together, and was stable. Months later he started the trial. After meeting with Dr. Miller, Bruno was to follow up on other tests. We preceded on to having his routine blood work done. Unfortunately, it was something Jacel was going to have to go back to have done the following day because they were having difficulty getting enough blood drawn from him. From here we moved on to our next location, Bruno was to have an EKG test. Once we got upstairs, Jacel and I noticed that Bruno started not to seem himself. As you can see in this image, a change has now started to occur. He began having long dazes. He wasn't himself at all. Usually he's arms and legs are waving. He was completely still, and began to be unresponsive. You can see the concern on Jacel's face. After Bruno's EKG we sat in the waiting room right outside for a little while to see if he would snap out of it. Bruno was feeling warm. This fever would soon come to be a sign of what was yet to come. Jacel began giving him some medication, but nothing changed. We decided it was best to go back to Dr. Miller. Once we arrived to Dr. Miller's office, Bruno began having seizures. These seizures were different and not so noticeable to the eye as other seizures he has had, except for his hands, they were shaking as the seizures were happening. After trying a few emergency medications that seemed to have had no effect on him, Dr. Miller suggested we head to the emergency room. He notified them we were coming, and when we arrived another seizure insued. 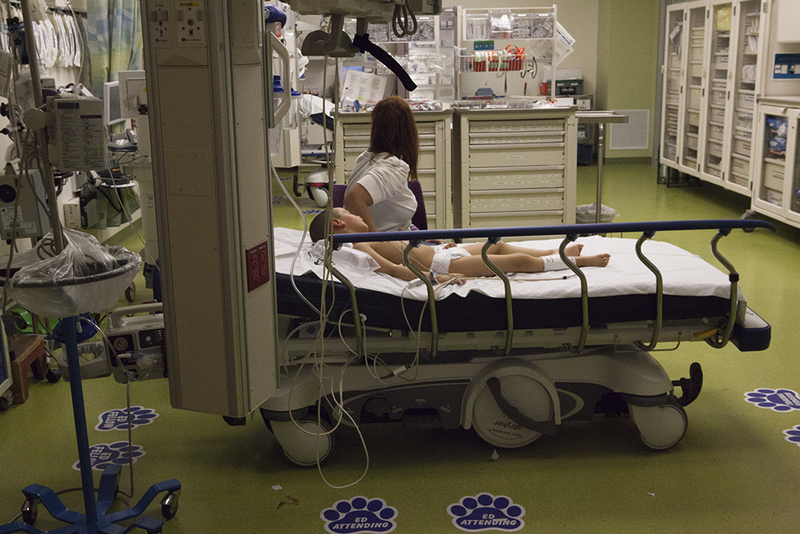 The nurse took Bruno from Jacel's arms into hers, and rushed with him down the hall, around the corner, into the trauma center. Within seconds, there was one after another entering the room attending to Bruno. It was a pretty intense time, so I don't remember how many doctors and nurses were attending to him. Never did I think that our day would have come to this. But, this is a true indication of what life is like for the suffering and their families. They live never knowing what their day will bring. That night Bruno was submitted into the ICU. During the night his fever spiked and he had four seizures, bringing his oxygen level down to 1%. This image represents all the children that are suffering. Bruno was finally released from Miami Children's Hospital on Feburary 11, 2016. What they discovered was that he had contracted Coronavirus, which can be equivalent to a common cold. The nonconvulsive seizures, and spiked fevers were all indications of the cold he had contracted. This goes to show how delicate the bodies are of these children. Can you imagine all of these things happening, and seeing your child turn blue and go to having 1% oxygen? I would like to thank Dr. Miller and the entire staff that I met that day at Miami Children's Hospital. Everyone I encountered was so kind. Please I encourage everyone seeing this to please share with your family and friends. Spread the word. The road the suffering and their families are trudging is beyond difficult. I am committed to sharing these stories in hopes that hearts are being reached. People are not only suffering, they are dying; children are dying. These stories are more common than you would think. We can't sweep them under the carpet anymore. Everyone deserves the chance to try every option available that may be able to not only ease their suffering, but to save their life. Educate, Advocate, have Empathy, Compassion, and Love. Please tune in to CNN at 9pm for 's "Weed 3." Watch/TIVO/tape it- or whatever, just see it! It's time for all of us to really open our eyes. The state of Florida at this moment sits at the forefront of a major decision that could impact thousands of lives. With Charlotte's Web now signed into law, the important vote hangs in the balance when the public votes on Constitutional Amendment 2 come November 4th, 2014. Charlotte’s Web, also known as the “Compassionate Medical Cannabis Act of 2014”, has a limit on cancer and epileptic candidates. When it was legalized, it created a huge dichotomy between its one strain of medical cannabis of low THC, high CBD, and that of the all encompassing Amendment 2. This would permit all strains of medical marijuana to be available for those on a wider range of afflictions who have been deemed in need by the evaluation of their licensed medical physician. This complex and very controversial matter comes with a question: What should be the level of care that exists for a patient in need of medical marijuana? My partner Jason Greene suggested in one of our meetings I look into Charlotte's Web, being it may be a topic I would be interested in due to it's heavy debate in Florida right now. I recalled a little girl in a documentary that I had seen some time ago on CNN called, "Weed", commentated by Dr. Sanjay Gupta. I forgot that that the child in the documentary was actually Charlotte Figi, the then five year old little girl that Charlotte's Web was named after. Researching I stumbled upon a CNN interview with single mother of two, Jacel Delgadillo. In the interview she was speaking of her deep desire for her son Bruno to try medical marijuana. Charlotte Figi suffers from Dravet syndrome, the same condition that Jacel's three year old, Bruno Stillo suffers from. This subject understandably comes with many preconceived notions. I hope you will take this journey with me. My goal is to bring awareness. My hope is to educate the public. "If you can't explain it simply, then you don't understand it well enough." Meet Bruno; he is three years old. Bruno's first seizure was at three months old. He suffers from Dravet syndrome, a chronic form of Epilepsy. Bruno's seizures now exceed beyond 300+ a day.